Looking for a new jacket or coat? There are a lot of models and styles to choose from. But be sure to get the right size! Not sure? Let us help you determine your jacket size in 1-2-3! How to Measure Men's EU Jacket & Coat Size? Waist: Measure circumference around your natural waistline. Your waistline is situated at the point where torso is narrowest/slimmest. 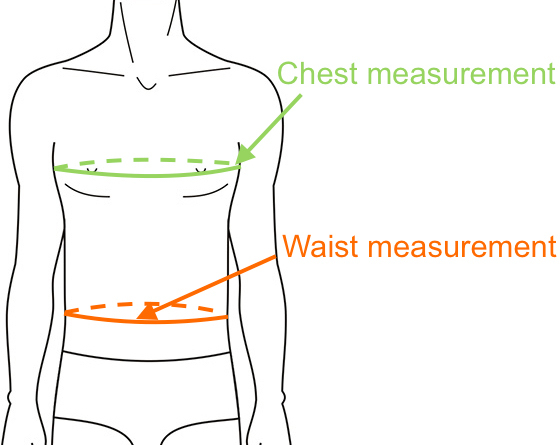 Chest: Measure circumference around your chest at the fullest part, under your arms. Make sure to keep the measuring tape parallel with the floor all the way around. Use your measurements from above (in cm) and determine your jacket/coat size from our Jacket Size Chart below. Do you prefer inches? See next size chart! If the size label says i.e. "size M" or "40", and nothing more, it is most likely a jacket or coat with regular length. But some men need shorter (short) or longer (long/tall) jackets. This means longer (or shorter) sleeves, and sometimes also jacket body. Short jackets/coats are usually labeled with S (i.e. MS or 40S), and long/tall jackets aure usually labeled with T or L (i.e. XLT, 46T, XLL or 46L). But how to know if you need extra long (or short) length? Tall/Long size usually means that sleeve length is about 1 1/2'' (3.8 cm) longer, and jacket/coat body is also about 1 1/2'' (3.8 cm) longer than regular length. Short size means about 1 inch (2.5 cm) shorter sleeve length and about 1 inch (2.5 cm) shorter jacket/coat body length. Tips, Tricks or Questions about Men's EU Jacket & Coat Size? Tips, tricks or questions about men's EU jacket sizing? Please post below. Thanks!